Cas Antico II tapestry shows an ancient urn in gorgeous color. Here we see an ancient Greek or Roman urn in gray, with intricate carvings on its surface, masterfully rendered with cherubs and leaf motifs. A stone styled golden border completes the work. 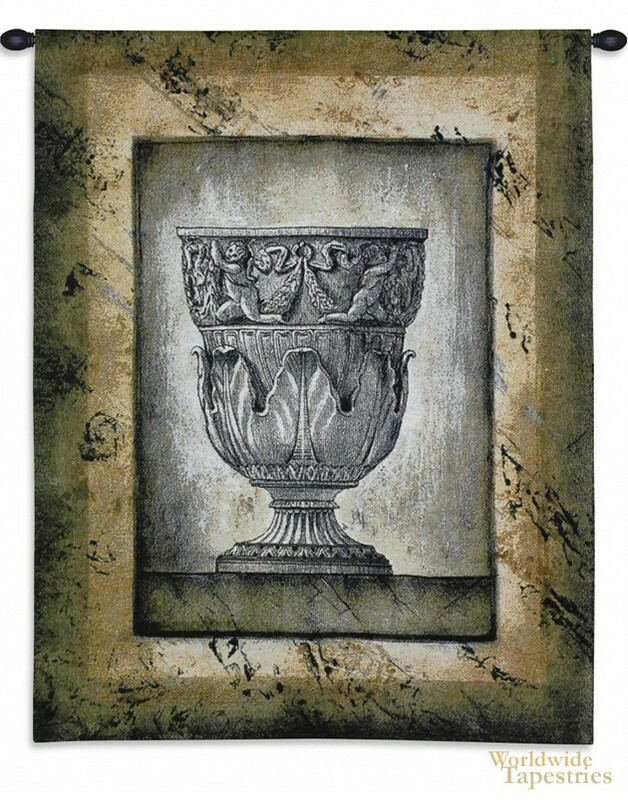 This work celebrates the classic subject matter used for still lifes in classical and ancient times. The earthen and stone feel of this work is beautifully rendered. Cas Antico II tapestry is backed with lining and tunnel for easy hanging. Note: tapestry rod and tassels, where pictured, are not included in the price. Dimensions: W 32" x H 27"